Many people love red barns. It is a classic symbol of Americana. But why are barns always painted red? the 1700’s farmers painted barns not for the beauty, but for necessity. The first barn-red color was created using Skimmed milk, linseed oil, lime, and red iron oxide. In the wintertime, the red color would absorb the sunlight, keeping the inside warm for the animals. Talk about resourceful! 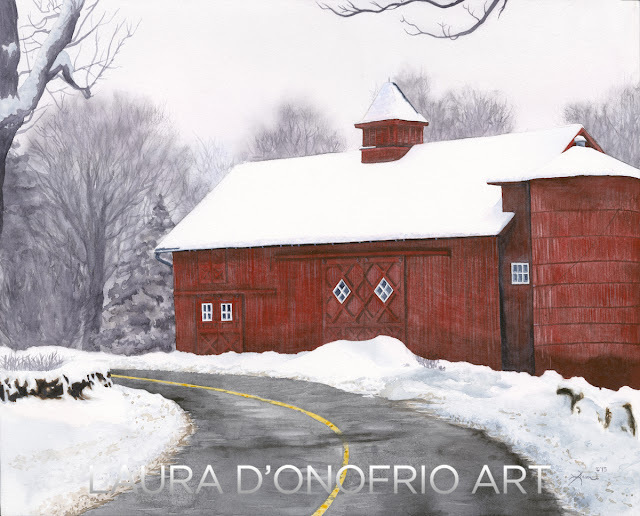 This particular barn can be found on Laurel Road in New Canaan, CT. It’s a lovely sight to see as you round the bend. I got a little creative with the trees, and painted them a bit foggy, just as the snow does when it is evaporating after a fall. I also added a little bit of salt to the road, because I wanted to be sure it was freshly salted for the drivers! When I was finally finished, I realized I had made a huge paint splotch in the upper left hand corner of my sky. This happens when I forget to put down a paper towel on my painting, close to the water cup. I will dip and splash water out of excitement, and am not careful. It had dried, so I could not get to it in time to remove it completely. Watercolor is so unforgiving – you can lighten, but you can’t often remove it! So what’s a girl to do? Well let’s paint a tree over it, of course! Now that the tree is in, I like that the tree is there, it balances the painting. So glad it worked out! A toast to a lovely watercolor barn, and to classic Americana! Special thanks to Kayleigh Pace, who is a fantastic photographer (as I am not! ), and let me use her photo as reference for this painting. Also thank you Alan Pace for the commission. Prints are available for sale, and can be found here. I love it because while I was looking at the painting, I truly forgot that I was sitting in my living room and suddenly I was THERE. I could breathel the damp cold, and remembered the chill that I’ve experience so many times. All of a sudden I wanted to go home and make hot chocolate. The essence of New England. It was emotional and impactful. Never forget it.